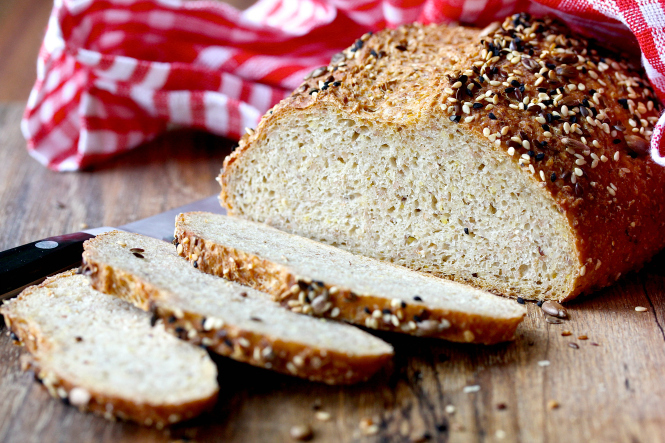 This Ten-Grain No Knead Bread is loaded with fiber, protein, and nutrition. 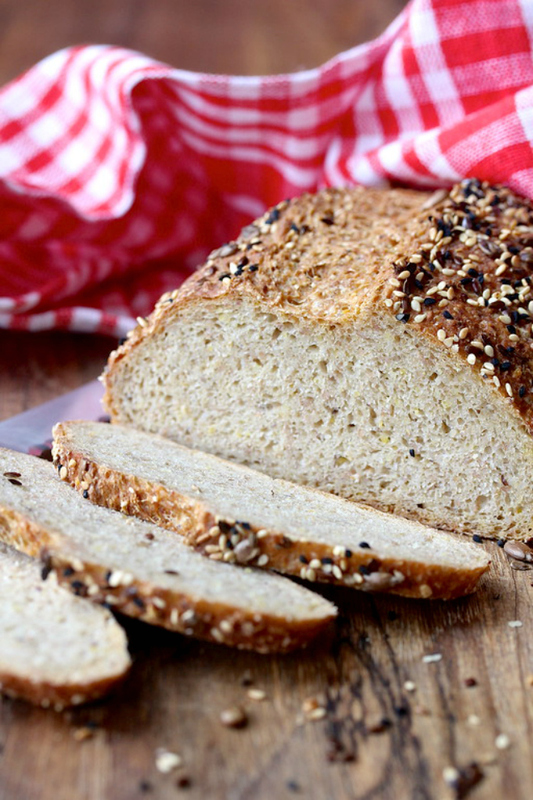 This 10-grain bread is full of all kinds of goodness. To add to the nutritiousness, I topped the loaf with a mixture of flax, sesame, sunflower, caraway, poppy, and anise seeds. I used Bob's Red Mill 10-grain cereal in this bread. It has wheat, corn, rye, triticale (a wheat and rye hybrid), oats, soy beans, millet, barley, brown rice, oat bran, and flaxseed. I've also used their 5-grain and 7-grain cereals in bread with great results. You can also mix your own multi-grain cereal for this bread (you may have to adjust the water). The dough for this bread is mixed by hand, and then allowed to rise. Once the dough has risen, you can refrigerate it for up to 10 days before shaping and baking. I made enough dough for two small loaves, baking the first one the next day, and the second one seven days later. How convenient is that?! The bread is fairly dense, similar to rye bread. It has a ton of delicious whole grain flavor, and is wonderful thinly sliced and spread with cheeses and smoked salmon, trout, or mackerel. It's also excellent served with soup.... perfect for winter lunches and dinners! Many thanks to Pavani of Cook's Hideout for choosing this month's Bread Baker's theme, "healthy" bread. 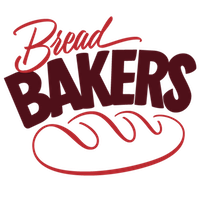 After the recipe, be sure to check out the links for a huge and amazing list of over 20 nutrient rich bread recipes for you to try. In a large bowl or dough rising bucket, whisk together the cereal, flours, yeast, salt, and vital wheat gluten. Add the water and mix with your wet hand to fully incorporate the flour. Cover the bowl with plastic wrap and let the dough rise for about 2 hours. Refrigerate the dough for one to ten days in a covered (but not completely airtight) container. When ready to bake a loaf, remove half of the dough from the container and shape it into an elongated loaf. Cover the dough with oiled plastic wrap and let rise on a piece of parchment paper for about 90 minutes to two hours, until slightly risen. If you have a baking stone, place it on the middle rack of your oven, and place a broiler pan below the stone. Preheat the oven to 450 degrees F. (If you don't have a baking stone, you can bake the loaf on a baking sheet). When you are just about ready to bake the loaf, bring one cup of water to a boil. Brush the top of the loaf with water, and sprinkle it with a seed mixture of your choice. With a serrated knife, slash the loaf lengthwise with a 1/2 inch deep cut. Using a pizza peel or the back of a baking sheet, transfer the loaf, parchment and all, to the baking stone. Cover the oven window with a dish towel and pour the boiling water into the broiler pan, remove the dish towel, and immediately close the oven door. Bake the loaf for 30 minutes. Remove the loaf from the oven and cool on a wire rack before slicing. Recipe adapted from Healthy Bread in Five Minutes a Day. Wow Karen I love everything about this bread. The crust looks crunchy and the crumb looks soft and moist! What convenience, Karen! I need a bread dough recipe like this in my life. We do get Bob's Red Mill but I've never seen the 10-grain cereal. I'll ask my local store that carries it if they can make a special order! It's one of their most popular cereals so I'm sure you'll be able to find it! I love Bob's Red Mill 10-grain cereal as a baking ingredient. That's a really pretty loaf with a great looking crust. Thanks so much Eileen! I love it too. So convenient. The seed topping reminds me of a bread that I buy all the time at Whole Foods-- I'd love to make it at home instead and look forward to trying your recipe. Great recipe and great topping. I am going to have to get some of that cereal. Thanks Debra! It's pretty awesome! I love all the grains in here! 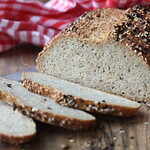 So healthy and nutritious bread, love this ten grain bread. I might bake some bread this weekend, it will be horrible weather, icy, snowy, that kind that makes a Brazilian want to hibernate. It's a little chilly here. 65 degrees. Evil grin. The bread looks delicious with a perfect crumb. I would love a slice with just some warm butter slathered on it. Awesome pick for the theme! Thanks so much Smruti! That's just the way I like it too. Karen....I am always in awe of your most beautiful breads. This one is no exception. I love multigrain breads and really prefer denser breads over fluffy breads. Love that it's no knead, too. And your photos are wonderful! Thanks so much!! You made my day/week/month! Hello Karen, This surely is a healthy bread. 10 cereals and so many seeds.Your bread looks stunning! That's a beautiful and rustic looking bread. Love all those grains in there. Perfect and delicious healthy bread. I love this...it is absolutely going on my to make list Karen! Love the seeds on the bread. Wonderful looking loaf Karen. Wow - this is inspiring. I just posted a no-rise challah bread. Now you've got the no-knead covered. I am going to try this. Sounds simple and flexible. My favorite adjectives for baking!